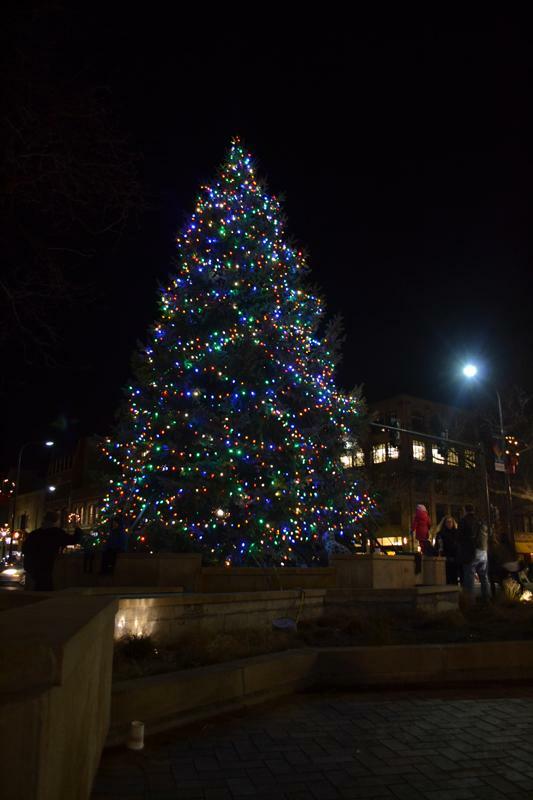 A Christmas tree was lit during the annual Evanston holiday celebration Friday evening. The event hosted various performance groups as well as Santa Claus and Mayor Tisdahl. Hundreds of people gathered Friday night at Fountain Square with Evanston Mayor Elizabeth Tisdahl and Santa Claus to light the city’s Christmas tree. The tree lighting was part of Holiday Bash, a five-hour event that offered activities ranging from listening to choir performances to visiting with Santa. Held near the intersection of Davis Street, Sherman Avenue and Orrington Avenue, the tree lighting commenced after Tisdahl, Santa and Mrs. Claus arrived on a firetruck, drawing crowds of people. Carolyn Dellutri, executive director of Downtown Evanston, said more people attended this year than last year. Holiday Bash was also made possible by Northwestern and Evanston student groups. Dance Marathon made a guest appearance, performing a routine to “Turn Up the Music” by Chris Brown. NU a cappella groups such as Brown Sugar and Purple Haze also sang for attendees throughout downtown. Dellutri said Associated Student Government also played a part in putting the event together. The Evanston Teen Choir and the Second Baptist Church Choir performed for attendees before the tree lighting. Tisdahl led the countdown to the lighting as attendees cheered. Glowing with colorful lights, the tree stood about as tall as the flag pole bearing Evanston and American flags adjacent to it. Dellutri said the mayor was “ecstatic” about the evening.